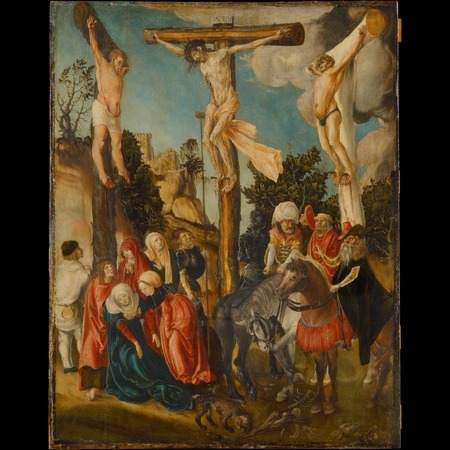 "Prelate Peichl rang yesterday and informed us that the Scottish foundation did not need to sell the Scottish Crucifixion at present; Stix ensured them that should it become necessary in the near future, the KHM would pay a fair price, as there is a certain public interest that this painting, which is bound in a special way to Austria, should not leave the country." - Gal. Akt Z.20/1934: (compare Zl. 25 u. 30 / ex 1932, Zl. 2, 5 u. 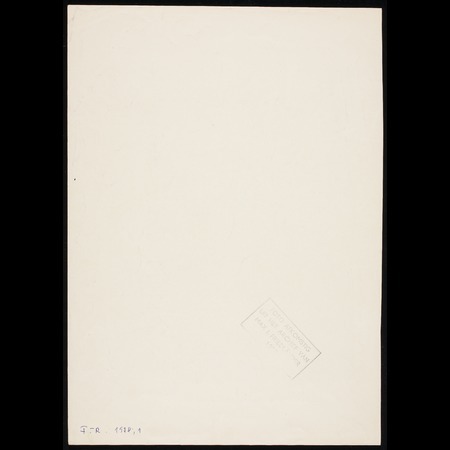 9 / ex 1934, Z. 33 /1933, Zl. 17 / 1934, Tausch XXIII. pro memoria 23.11.1934, Stix: State Secretary Dr. Pernter agrees to the purchase of the Scottish Crucifixion, financed with the sum of 90,910 Shillings from two fonds. To Dr. Peichl, Abt-Koadjutor, 24.11.1934: the office for the protection of public monuments accepts the sale to the KHM. Buchner (Bayr. 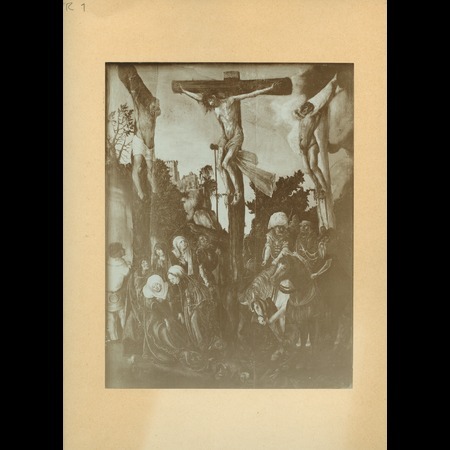 Staatsgemäldesammlungen) to Buschbeck, 13.11.1934: 'I have heard, that the Cranach Crucifixion belonging to the Viennese Scottish Monastery is available.' 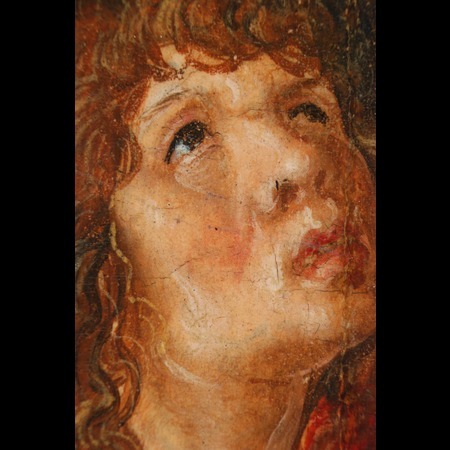 Should the KHM not acquire it, the Alte Pinakothek would make efforts to do so. - Gal. 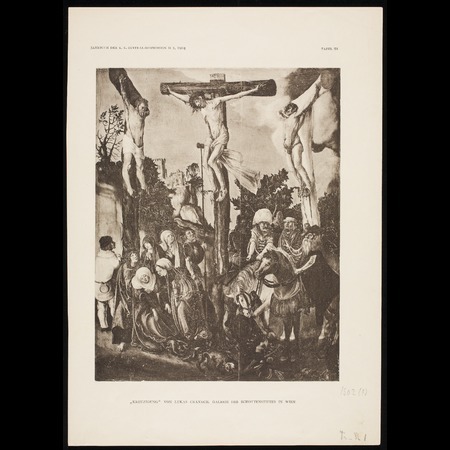 Akt Z.3/1935: Documentation from the Cranach Exhibition in Vienna, with a loan request to the Albertina the Österreichische Nationalbibliothek (2 copies of the Missale Pataviense) and the Academy of fine Arts as well as photographs of contemporary works in foreign collections. - Gal. Akt Z.1/1936: Exhibition ,The young Cranach'. The acquisition of the earliest Cranach [...], offered us the opportunity to organize a small exhibition about the young Cranach, the early works created in Austria. The two originals in the Gallery were united with two paintings from the Academy in one room and while the graphic works, part in original from the Albertina and part as facsimile reproduction, were displayed in an adjoining room. Photographs were exhibited of paintings and drawing that existed outside Austria'. Seipel et al. 2007 182 with Fig. Title Studien zur Frühzeit Lukas Cranachs d.Ä. Deroo 1996 20-21 with Fig. Editor National Gallery of Art, Washington, D. C.
Title Lukas Cranach d. Ä., Kreuzigung Christi. Um 1500 [...]. P. 1934 B 10 with Fig. 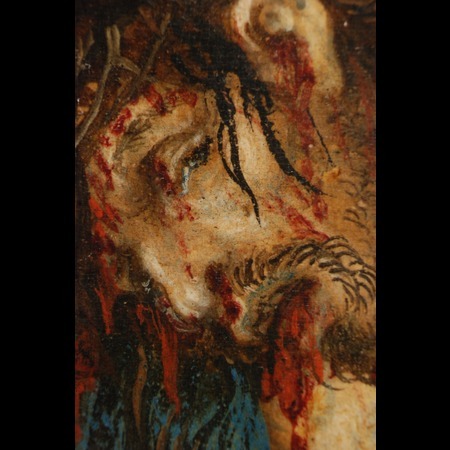 The painting depicts a many figured crucifixion set in a rocky landscape, the cross in the centre of the painting is made from crude logs, roughly worked, the figure of Christ is covered in blood and exhibits extensive wounds (stigmata). 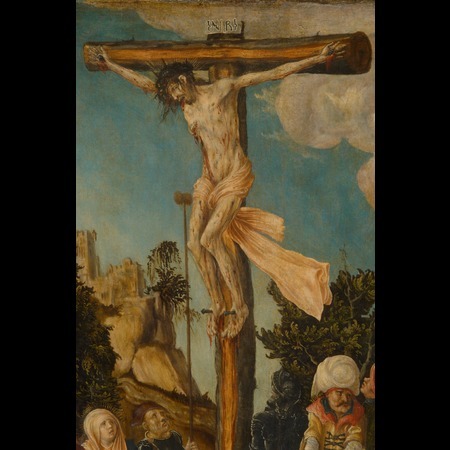 He is flanked to the left and right by the two thieves, both have also been crucified on crosses made using crude logs. The assistant figures at the bottom of the cross are divided into two groups, to the left the weeping women and the Virgin with St John, on the far left a peasant figure, to the right a group of three conspicuously dressed men on horseback: one with a moustache wearing a large white turban, and a white undergarment covered by a sleeveless yellow coat with a wide red collar and fastened with laces. The horseman to the right is wearing a cone shaped hat, with a broad rim folded up on one side, a black coat with a fur collar and long, loose-hanging sleeves. The expressive style of the figures equates to the depiction of the landscape with rocky cliffs and tousled and bare trees. The depiction of the Crucifixion differs in format but above all in type from earlier and contemporary late gothic painted versions, as it is not part of a cycle but rather an altarpiece. This raises the question of its original function, possibly as small retable, devotional or private image. 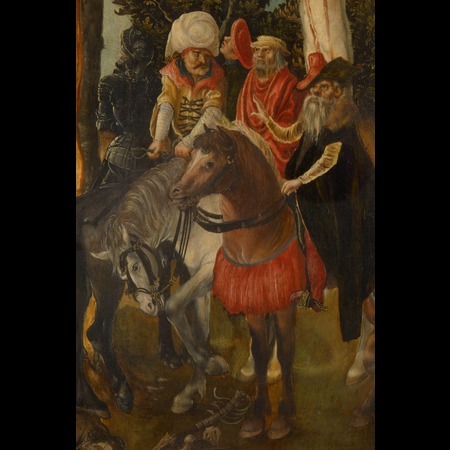 The painting, formerly in the collection of the Viennese Scottish Foundation, had until 1904 been attributed to Lucas van Leyden, and was identified by Friedrich Dörnhöffer as one of the earliest known works by Lucas Cranach and dated to 1500. 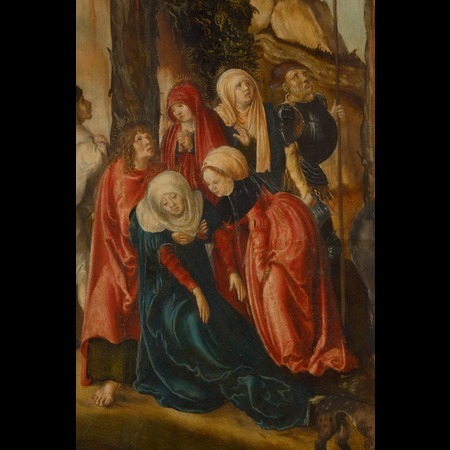 It was thus positioned on the pinnacle of Cranach's early work, which since the mid 19th century has gradually been identified as stylistically belonging together and by one artist. It was above all the exhibition in Dresden in 1899, which played a key role in this research. At the same time it was realized that this stylistically coherent body of work - partially panel paintings of on the one hand Christian subject matter on the other hand portraits of Viennese humanists and partially woodcuts which radically differ from the late gothic works by other contemporary artists and indeed his own later works - was produced during Cranach's stay in Vienna. Friedländer (1932) was the first to attempt a chronology of the early works created in Vienna. 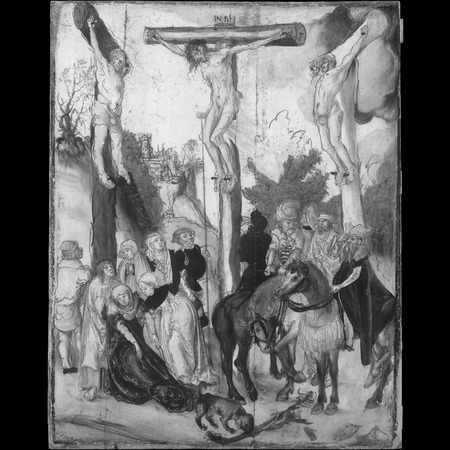 He put the Crucifixion in first position before two woodcuts, which also depict the crucifixion, one of which bears the date 1502. 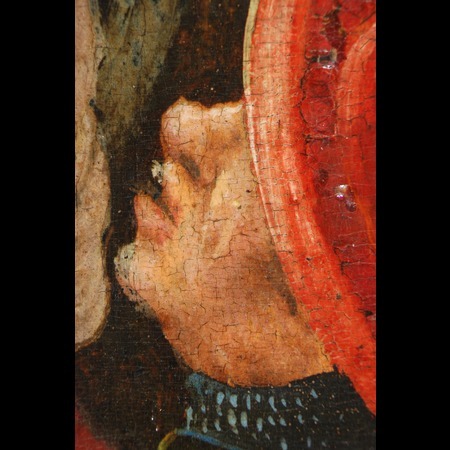 According to Friedländer the drawing in the panel seems more tentative and more undecided than that of the woodcut from 1502 and may be of an earlier date. Crucial therefore is, amongst others, the question of where Cranach worked before his stay from 1501/1502 in Vienna. As early as 1899 Flechsig assumed that Cranach must have spent time in Budapest on the grounds of a strangely clothed horseman, which he thought to be Hungarian, in one of the early woodcuts of the crucifixion. The Hungarian looking clothing of the horseman in the Viennese Crucifixion was an additional reason. A document appeared to support this theory. It was assumed that Lucas Cranach may have been related to the Kronacher family who can be traced both in Ofen and Vienna. Johannes Kirchhaimer, 1458 and 61 Dean of the medical faculty at the University of Vienna was with respect to the conflict of 1462/63 between King Friedrich III and his brother the Archduke Albrecht one of Albrecht's leading followers. For this reason he had to leave Viennaduring the reign of Friedrich III and settle in Ofen. There one of his daughters married Albrecht Kronacher, citizen of Ofen, about whom nothing further is known. Albrecht's son, Ulrich Kronacher, returned to Vienna and reclaimed his mother's house; from 1511 he is mentioned as citizen and house owner/landlord in Vienna. Anzelewsky questions this line of argumentation. 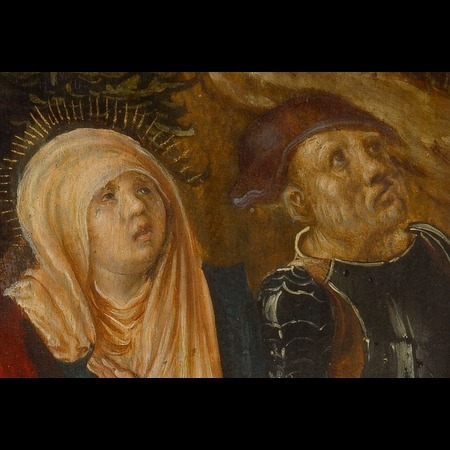 It is impossible to draw conclusions from the mere concurrence of names and the eastern European costume in both the crucifixion woodcuts and the crucifixion panel are polish and not Hungarian. Anzelewsky draws a comparison with the clothes of the soldier in the depiction of the battle of Orsza (Warsaw, NationalMuseum)  by an unknown artist (recently attributed to Hans Krell), the minatures in the Behaim-Codex, and similar costumes in the Adoration of the Magi (Berlin, Gemäldegalerie) by Hans Süß von Kulmbach and which was probably painted in Krakau. Anzelewsky concludes that before Cranach went to Vienna he must have been in Krakau between 1498 and 1502. Incidentally, similar to Vienna and later Wittenberg, Krakau was a princely residence with a university, which probably offered the artist good prospects. In contrast with the stagnant mannerist style, which had been passed down in the artisan tradition of the late gothic through generations of workshops and their apprentices, the young Cranach's new individual style was suited/appropriate for the quick blossoming Viennese Humanism around 1500. In fact Cranach was in close relations with the main representatives. He made woodcuts for the printer Johannes Winterburger who had been in Vienna since 1493, for Johannes Fuchsmagen he drew monthly depictions after a Filocalus manuscript from late antiquity and he painted a depiction of St Jerome in the desert in 1502, which was formerly thought to have been commissioned by Johannes Cuspinian. A drawing of the sculpture 'The Youth of Magdalensberg' which had been discovered in 1502 indicates, just as the copies of manuscripts from late antiquity, the antiquarian interest s of a learned client. Around 1502 he painted portraits of both the humanist Cuspinian and his wife Anna Putsch, in 1503 he painted a further portrait pair of a humanist (in the past wrongly held to be a portrait of the lawyer Stephan Reuss, several times dean of the faculty of law and 1504 rector of the university.) and his wife in a landscape, which equals in appearance and artistic quality the Cuspinian portrait pair. Deutsche Kunst-Ausstellung Dresden 1899, Abteilung Cranach-Ausstellung, K. Woermann, Dresden 1899; Heiser 2002, 29ff. Mentioned by Schuchardt in 1851. First of all by Friedländer, in: Sitzungsberichte der Kunstgeschichtlichen Gesellschaft zu Berlin 7, 1899, 31-34; Friedländer 1932 (1979), 16; Bierende 2002, 16. Glaser 1921, 17ff. ; Bierende 2002, 33ff. P. Vaisse, Überlegungen zum Thema Donauschule, in: exhibition cat. Altdorfer und der fantastische Realismus in der deutschen Kunst, Paris 1984, 149ff. ;Locicnik 1990, 170ff. ; Heiser 2002, 34ff. ; Bierende 2002, 24ff. Carried out in a fluid medium with a brush or possibly feather. The underdrawing is visible with the naked eye in areas where the paint application is thin or where it has become more transparent over time. 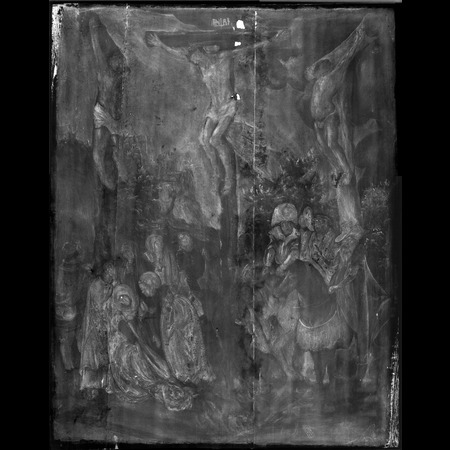 Infrared reflectography shows that in the underdrawing Cranach sketched in all the figures and forms. Between the preparatory drawing and the final painted version no significant alterations were made to the composition. The drawing has a free and sketchy character. 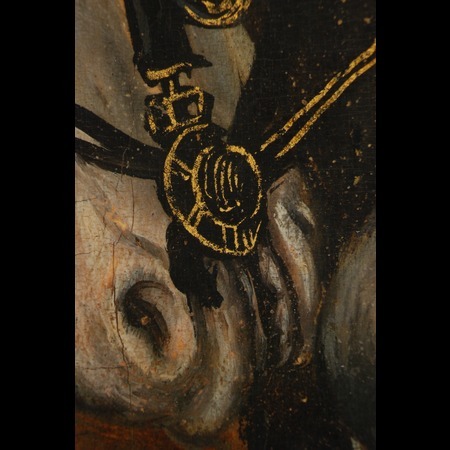 It can be presumed that Cranach applied the fluid medium to a large extent with a brush (for example in the area of the trees). Some of the lines change direction so abruptly that it is plausible that a feather may have been employed (Eg. the man on the left hand side in the foreground looking up at the cross). 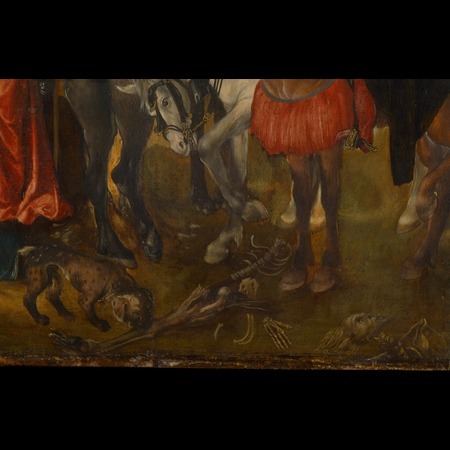 It seems to be a design created by Cranach, which he used as a base and as preparation for the painting process. In the period around 1500 Cranach did not yet run his own workshop and was not attached to such an infrastructure in Vienna as an employee . As was already observed by Ingo Sandner, the identified underdrawing from the period before Wittenberg (1504) is sketchy and to be viewed as a preparatory design . A significant correction for the composition of the painting is visible in the change in the perspective of the horizontal member of the good thief's cross. In the group of men on horseback some corrections were made to the horses' legs: the fore-leg of the white horse, which is barely visible and whose rider wears a red cloak, was originally further to the left. There is no underdrawing beneath the present painted position just as is the case with the only visible hind-leg. It appears as if the artist had problems arranging all the horses and riders in this small area. The castle in the distance was changed slightly: the original drawing of a round tower was changed to a crenelated square one , and it appears as if originally more vegetation was planned. 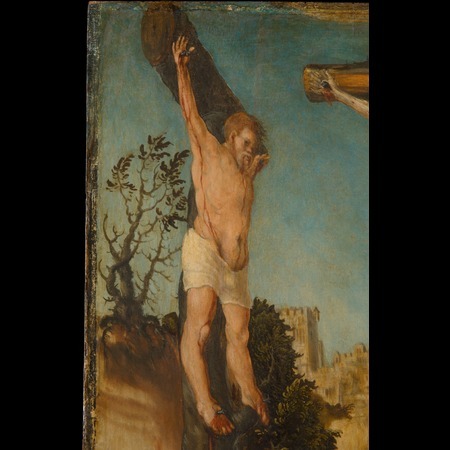 Christ's loincloth is not included in the underdrawing and was not intended to be so extensive as -according to the underdrawing- the tree to the right of the cross should have risen up higher. Christ is depicted as a naked figure, while the clothes of the thieves are meticulously drawn. 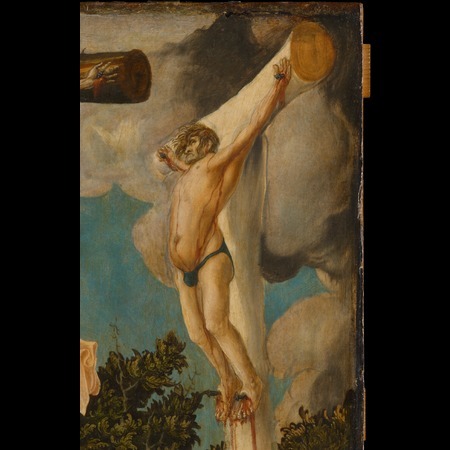 It is not to be assumed that Cranach wished to break so radically with conventions and depict Christ without a loincloth, but apparently it was first conceived in the painted version. This is remarkable considering it is the central motif of the crucifixion; and it is executed in a rather unusual manner (without knots or convolutions). 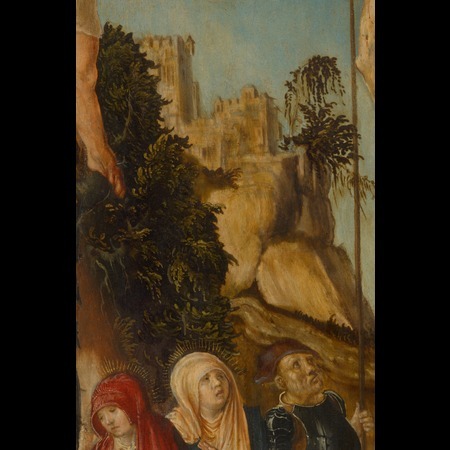 We came to this conclusion after a comparing the underdrawing with that of the sitting angels in Rest on the Flight into Egypt, Lucas Cranach the Elder 1504, Berlin, Staatliche Museen, Gemäldegalerie; identified by both I. Sandner [Sandner 1998, 54, Fig. 7.2] and A. Siejek [Siejek 2004, 82, Fig. 40] as having been executed with a feather. [Bierende 2002, 7] : The author suggests that the Salzburg Trompeterschloss is depicted here as in the Schedel'schen Weltchronik. The underdrawing does not support this theory. The painted area measures 57 x 44.5 cm. 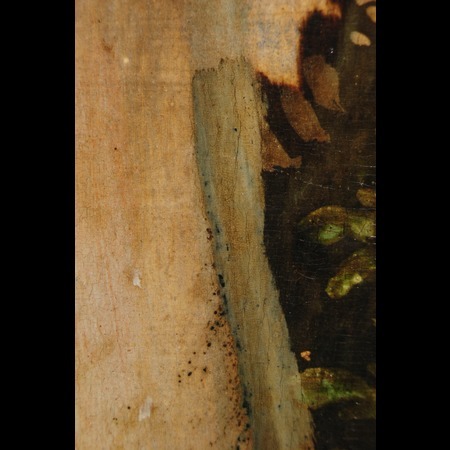 The unpainted edge (varying in width) of the painting and a barbe created by the ground are visible on all sides with the exception of the right hand side, where they are only partially preserved. The unpainted edges and the barbe do not run parallel to the edge of the panel presumably because the painted area was originally at a slight angle to the panel and the panel was later cropped slightly (probable when it was mounted and cradled). This would have been when the barbe and unpainted edge were partially removed from the upper right hand edge. Along the edges,above all left and right there are remains of an early (original?) black coating (see also IRR image). The edge of the painting was later reworked (retouched). Various areas of the painting present a wide spectrum of different methods of paint application and thickness. In some areas the paint has been applied in a number of layers. Sometimes the final layer is impasto with a localized underpainting as with the trees and drapery, whereas in other areas the paint was applied thinly and distributed with a brush, partially wet-in-wet, as with the landscape in the fore- and background and the clouds. In many areas the slightly toned ground or imprimatura was incorporated into the final image e.g. the part of the tree trunk without bark (central cross). In many areas there is local underpainting, generally brown or grey tones e.g. the Virgin's robe. 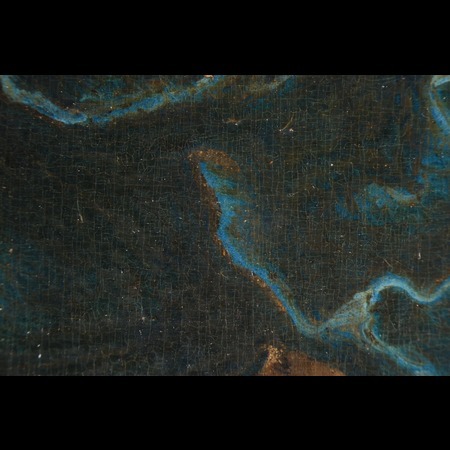 The blue paint layer (presumably azurite with the addition of lead white to model the folds) is above a brown underlayer, which has been partially left unpainted along the folds. The foreground has an initial warm brown layer, while the trees on the horizon are dark grey and the horses are partially underpainted with light grey. A great variety of approaches can be observed in the application of paint in red areas. 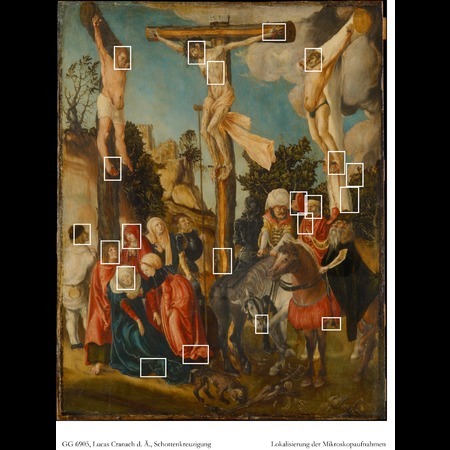 Cranach employed different paint layer combinations to achieve a variety of hues and shades. 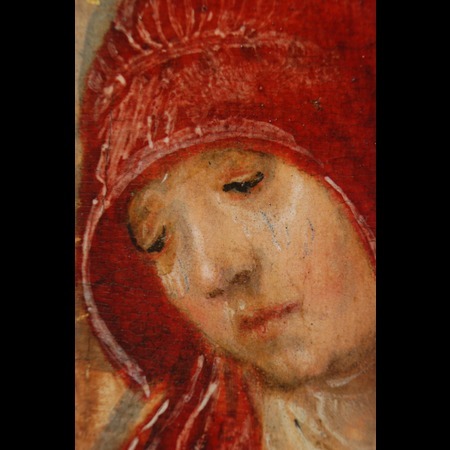 In the red garments of the figures around the Virgin the red paint is applied over a lighter layer containing lead white. 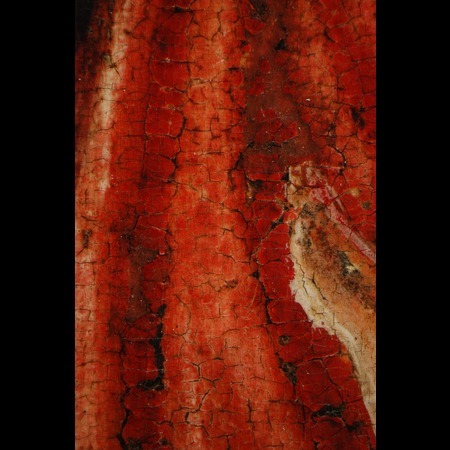 In other areas the red paint appears to lie directly over the ground, as in the red arm of the Virgin or the garment of the woman behind her. The areas of shadow in the draperies are achieved with a red lake glaze and appear to have an initial black layer and/or to be modulated with black paint in the darkest areas. 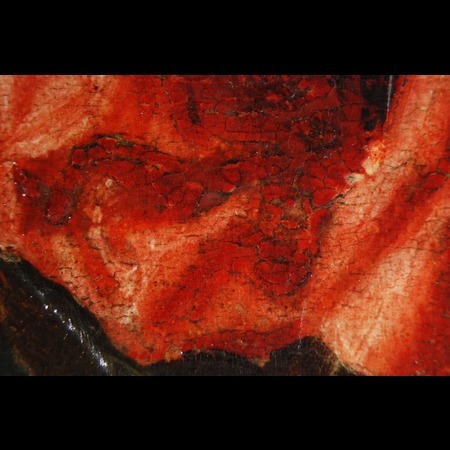 Other red areas, such as the cover of the brown horse have a continuous black underlayer, followed by a red paint layer with white highlights. 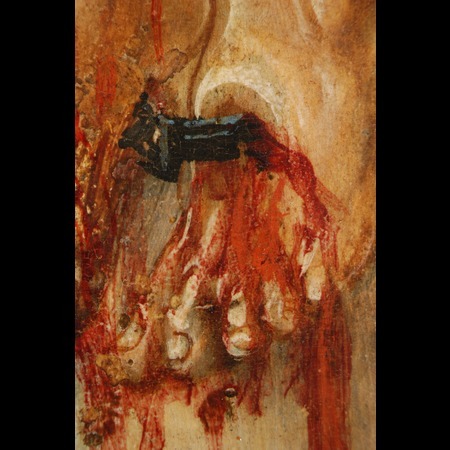 Cranach executed the flesh paint employing an initial localized light paint layer. This layer was frequently applied on a larger area beyond the exact outline of a face, as is clearly visible in the X-radiograph, e.g. 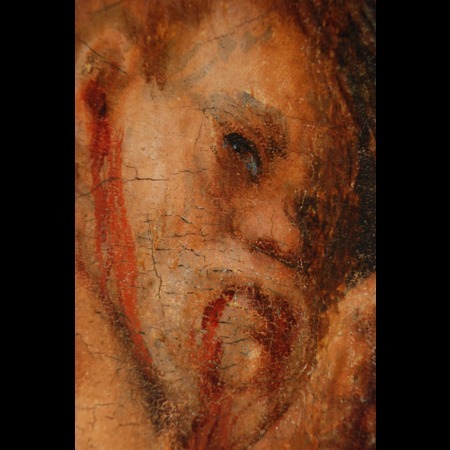 in the figure of St. John where the free brushstrokes feather out above his forehead. Heydenreich describes the differentiation between faces -often within one painting- with the aid of varying painting techniques . 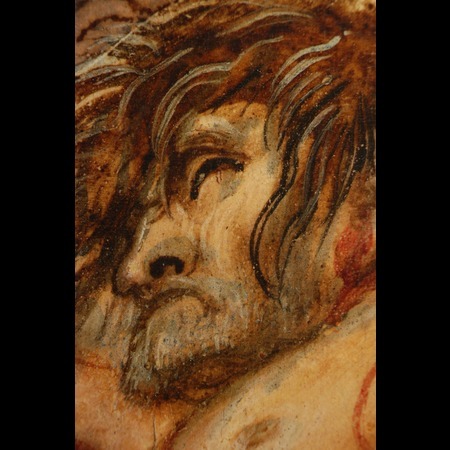 Variation in the deployment of lead white and brushwork can be observed in the Crucifixion. The highlights in the faces of the women appear to be softer and flatter in their modulation, whereas in the male faces they are more prominent, with visible brushstrokes and appear to have been applied with a pointed brush. Depending on the desired shade and hue the flesh paint is modelled with either brown or reddish glazes, that of the women is general kept in a cooler tonality and accordingly contains more lead white. 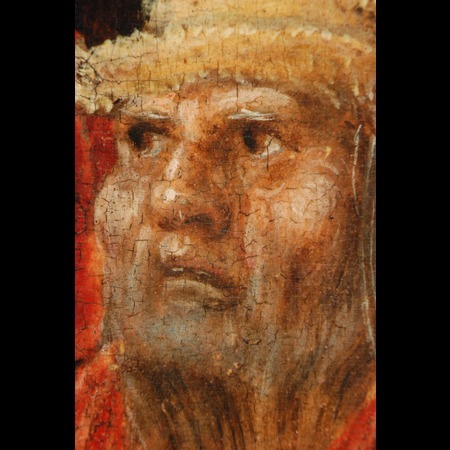 Brown glazes were employed for the male faces apart from the central figurative group. The facial form was achieved with single brushstrokes, not blended, for the highlights. In some of the faces blue pigments were added to the paint to indicate beards. The richness of detail in the figures is remarkable despite their small scale. 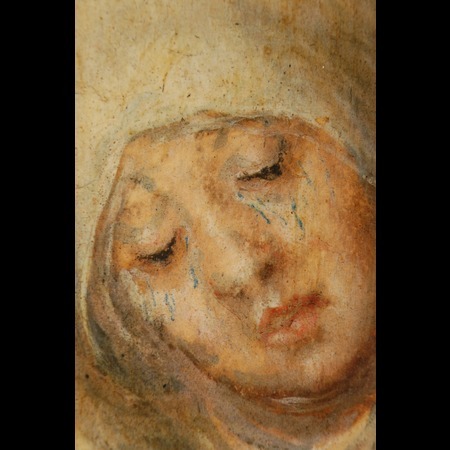 The women's tears are painted with a very fine paintbrush as a gentle blue stream. 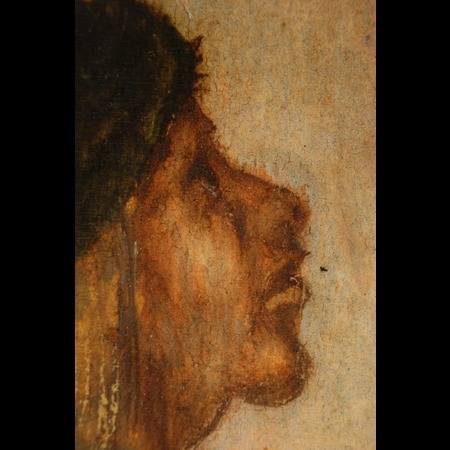 The oppressively realistic depiction of the crucified Christ's lips is also in blue paint. 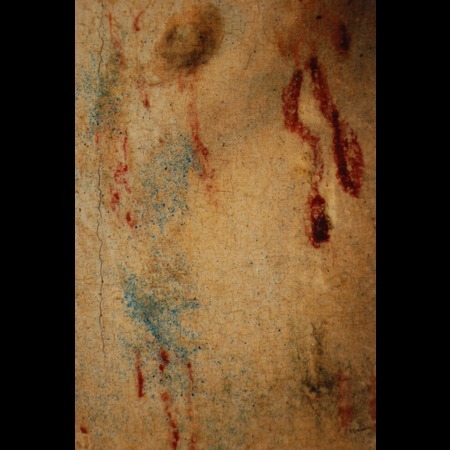 The traces of blood on Christ's body were applied to the dry flesh paint whereas the bluish wound is painted wet-in-wet. The blue pigment employed is relatively coarsely ground and irregular in size. Isolated green pigment particles are also present. To depict the metallic shine of the nails highlights in blue paint were employed. Powdered gold was employed for the saints' haloes and the decoration of the robes and tack. The foliage was initially painted with a greenish or brown base tone. A more detailed formation of the leaves and branches followed -partially wet-in-wet - in numerous layers of various green tones and yellowish-green or ochre impasto highlights, which was completed with a now brown glaze . In some areas, like on the right hand side, this lower layer has in its consistency the character of a medium rich glaze and appears to have been spread out with a feathery hairbrush. The figures were laid in at an early stage of the painting process. While the figurative groups to the left and right of the central cross are overlapped by the foreground paint (with the exception of e.g. the Virgin's blue robe), some areas of the foreground have also been left uncovered, leaving the brown underpaint visible, e.g. between the front hooves of the horse on the right. The crucified figures also appear to have been laid in at an early stage, before the sky was painted. Their contours are partially cropped by the sky paint and partially lie side by side without actually bordering on each other. The sky seems to have been painted after the figures. However the crucified figures, the crosses and the large cloud formation were held in reserve, which is clearly visible in the X-radiograph. Here the observation made after infrared examination regarding Christ's loincloth is confirmed. It was not held in reserve as it acquired its shape during the painting process. The crosses were painted during a later stage. The clouds are essentially held in reserve in the blue sky paint with only a very thin light and dark scumble employed over the light ground, partially blended wet-in-wet, to modulate their structure. Only a few wisps of cloud are applied without reserve directly over the painted sky. Only the sides of the panel with the inscription INRI were indicated. The letters were applied directly on top of the clouds. Painted areas are juxtaposed in such a way that frequently tiny gaps occur between them where the only slightly covered ground or imprimatura has remained visible. This can be seen with the naked eye but is more clearly evident in the X-radiograph. 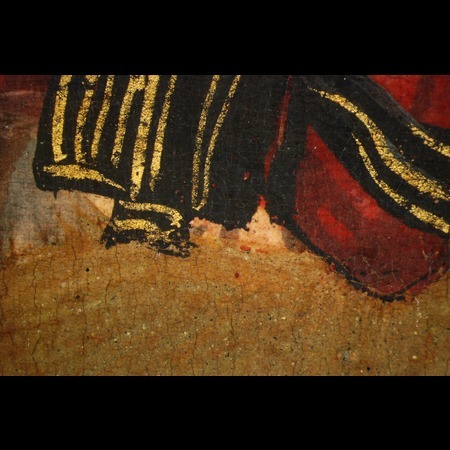 There are however tiny overlapping painted areas where the artist painted beyond an area which had been held in reserve or where a detail was added later. 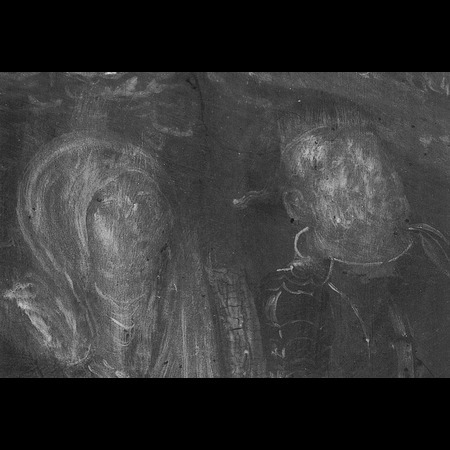 Most of the pentimenti occur where the painted version deviates from the underdrawing, as was already described in the evaluation of the infrared reflectogram. The perspective was altered to the left of the cross and numerous alterations were made to the horses' legs. Corrections within the painting process are hardly present. One exception is where the shaft of the good thief's cross was widened. 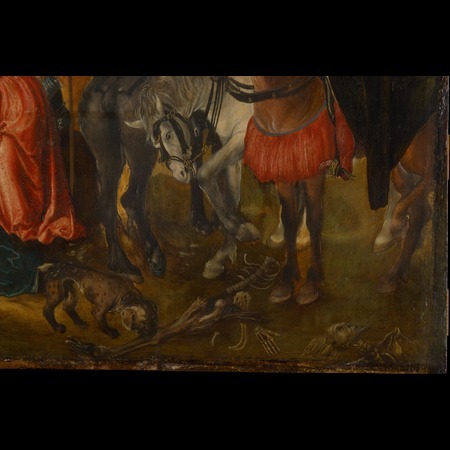 The process is interesting here: Cranach applied a dark stroke beneath the light paint employed to correct the width. This appears unusual in such a light relatively transparent area and was possible carried out to cover the impasto paint application of the foliage (see infrared reflectograph and X-radiograph). Some of the areas ,which appear brown today may originally have been green. Verdigris, an allkaline copper acetate, which has been frequently identified in Cranach paintings [Heydenreich 2007 A, 148] can turn brown with age. 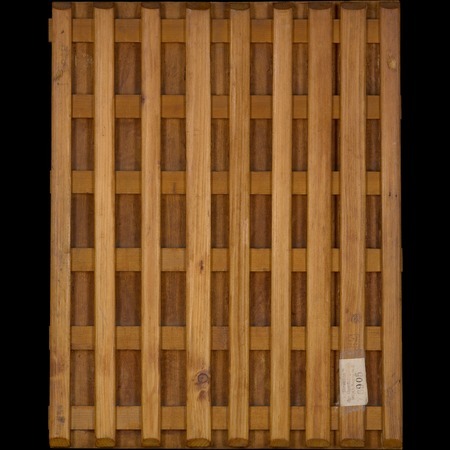 The x-radiograph shows that the panel is constructed of three planks and that the joins are covered on the painted side of the panel with a fibrous material. 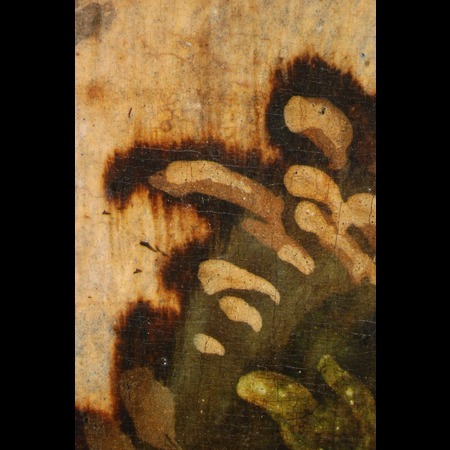 This has led to localised unevenness in the paint layer, which has resulted in increased abrasion of the raised areas  - in the X-radiograph this is particularly evident in the area to the right of Christ's cross. Wedge shaped wooden inserts are visible in the upper left and lower right hand corners. They probably date to the restoration carried out in 1934 and have a ground or fill containing lead white. Streaky brushstrokes can be observed in some areas, which probably result from the lead white content of an imprimatura e.g. in the foreground or in the torso of the thief on the right hand side. 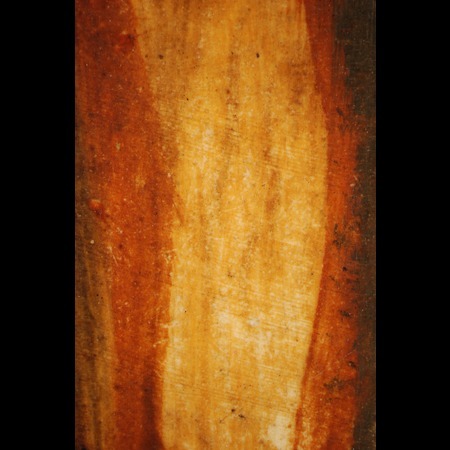 Vertical, dark bands are visible in the right hand plank that may be plane marks. The use of reserves (for the two crosses on the left and the clouds) and the slight gaps between adjoining areas of paint are clearly visible in the sky and along the contours of Christ and the thief to the left.The contours of the lance to the left of Christ were incised into the sky paint. In addition to the above mentioned abrasion and small losses in the areas where the fibrous material was applied, there are further tiny paint losses in the dark folds of the red robes. 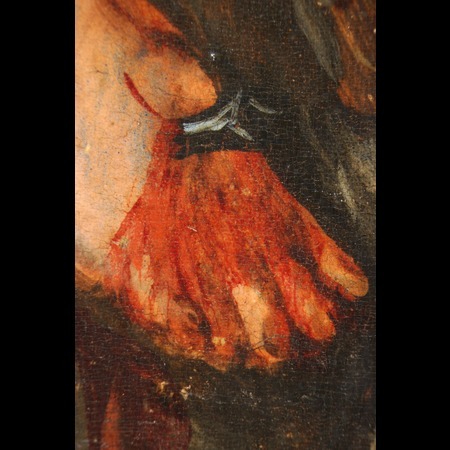 The right foot of the thief on the right hand side is rather damaged, exhibiting numerous tiny losses. 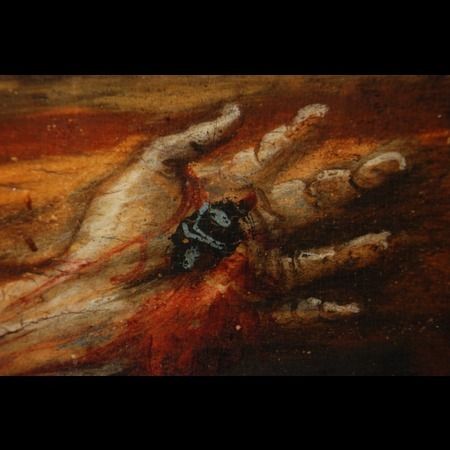 Three of the largest losses to the right of the Crucified Christ are filled with a material containing lead white. This fibrous material can become visible on the surface when it is present in areas that have been thinly painted, particularly if the animal skin glue applied as an adhesive has been caused to swell [Most 2009, 89].